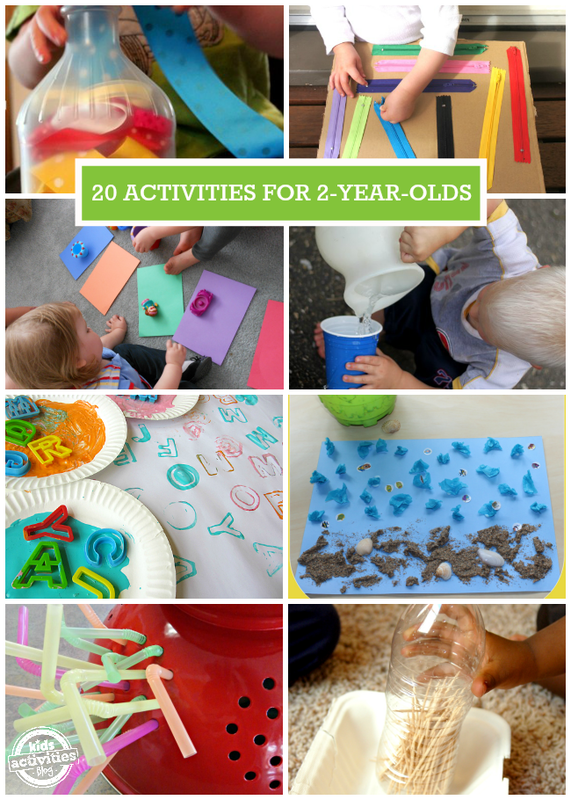 Activities for 2 year olds to do that are age appropriate aren’t always easy to find. It seems like I run into great ideas that are either too advanced for them or don’t spark their interest. So I searched around and found some amazing activities that are not only for this particular age group, but are also things that can be put together quick and easy. Perfect combo! 1. 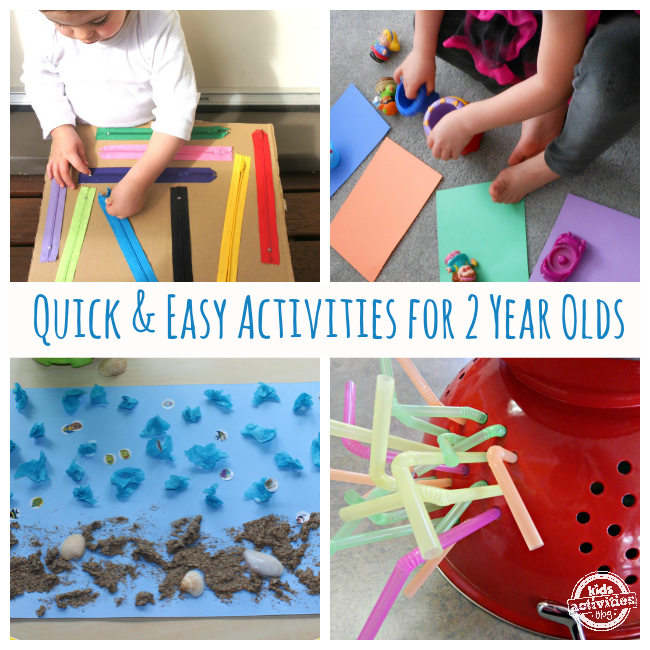 This simple fine motor activity grabs their attention and keeps them engaged. All you need are straws and a collander! 2. Color matching is a great way to start working on recognizing colors with your toddler. From A Mom With A Lesson Plan. 3. Make an interactive zipper board by hot gluing a few zippers onto cardboard. From Laughing Kids Learn. 4. This dinosaur obstacle course is a lot of fun and a great way of getting some gross motor skills practice. From Craftulate. 5. Here is an easy 3D art project for toddlers to make. From Red Ted Art. 6. Sit them down with a pile of ribbons and a bottle and let them push them into the small opening. Great for motor skills. From Hands On As We Grow. 7. Grab some balloons and make your own racquets from paper plates and paint stirrers for indoor tennis! From Toddler Approved. 8. This DIY toy helps toddlers develop fine motor skills through play with an empty water bottle and toothpicks. 9. Introduce them to the alphabet by letting them stamp with letter cookie cutters. From No Time for Flash Cards. 10. Make a package of jello and add some little figurines inside for your kids to dig out after it sets. From Tinkerlab. 11. Grab a few toy animals and action figures and press their feet into play dough while your child isn’t looking. Then, have them try to figure out which one left the footprint! 12. Fill a bowl with pom poms and then let your kids pick through and sort them by color in an ice cube tray. From Buggy and Buddy. 13. A simple activity like pouring water (in the bath or outside) can help them learn with some fun. From Hands On As We Grow. 14. Easily paint a little yellow chick by dipping a loofah into some paint and pressing it onto paper! From Meaningful Mama. 15. Art with no paint! On a warm day, fill a bucket of water and let them use paint brushes and sponges to paint your sidewalk or deck. From No Time for Flash Cards. 16. Make some pretty (and delicious) jewelry by stringing fruit loops onto some yarn. From Hillmade. 17. Use paper plates to make simple puzzles for kids. From Laughing Kids Learn. 18. Write the alphabet in permanent marker on a cookie sheet and then let your kids match each with magnet letters. From Super Mom of Twins. 19. Shape empty toilet paper rolls into a heart, square, diamond etc. to make your own paint stamps. From The Imagination Tree. 20. Let them finger paint without worrying about then licking their fingers after with this homemade edible paint. Previous Post: « Win Our Book + $50 – Oh ya!